Stock markets in the US and Europe plunged on Thursday as fears about US-China trade tensions and global growth continued to mount. 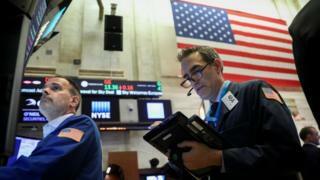 All three main Wall Street indexes fell more than 2%, though they regained some ground later in the session. In London the FTSE 100 tumbled 3.2%, or more than 200 points, to close around 6,700 – its lowest level in two years. Falls on European markets were even sharper, with Paris and Frankfurt both shedding almost 3.5%. Oil prices also sank, with Brent crude more than 3% lower. Analysts said the arrest of Chinese telecoms giant Huawei’s chief financial officer in Canada had revived worries over the US’s trade war with China. The renewed falls on Wall Street came as trading resumed after Wednesday’s stock market closure to mark the funeral of former President George HW Bush. The latest downturn quashed hopes that the markets might return to health after losses on Tuesday, when the Dow Jones index finished down 3%. On Thursday, concerns about oil prices, trade tensions and slowing growth sparked steep losses at financial, energy and materials companies in the US. Worst-hit sectors on the FTSE 100 included miners, oil companies, carmakers and tech stocks, with mining firms Antofagasta and Glencore among the biggest losers. Earlier, Asian markets had also fallen, with Tokyo’s Nikkei index shedding 1.9% and the Hang Seng in Hong Kong down 2.5%. Norman Villamin, chief investment officer at Switzerland’s Union Bancaire Privée, said the US-China clash represented much more than just a tussle over trade. “It’s not about trade – it’s about who is going to be the economic and political leader of the world in 10 to 20 years from now. It’s about tech, and who is going to dominate that landscape,” he said. Laith Khalaf, senior analyst at Hargreaves Lansdown, said: “The arrest of Huawei’s CFO has reignited fears that trade reconciliation between the US and China may not be forthcoming any time soon. “The market is spooked by the damage a continuing trade war could do to global economic prospects, and that’s hitting share prices in the UK and overseas. He added that “the valuation on the UK stock market looks close to its historical average, which means it’s neither Black Friday cheap nor dotcom expensive”. Analysts are worried a series of new tariffs will slow global trade. In October, the US trade deficit – which measures the difference between imports and exports of goods and services – increased to $55.5bn, the highest level in a decade. The record came amid a decline in exports, as major markets including China, the European Union and Mexico purchased fewer US products. All three markets have hit US goods with new import duties in retaliation for tariffs imposed by the Trump administration. “We’re looking for a sufficient cut to balance the market, equally distributed between countries,” said Saudi Arabia’s oil minister, Khalid al-Falih, before the meeting.